Welcome to Gonzo Gardens. Here you will find an overview of a wide variety of optical delights, mad doodlings, and visionary landscapes which express my views and experiments in energy, fantasy, and form. Take a look around and enjoy your stroll through Gonzo Gardens. You can also now find me on Facebook. A new Steampunk Gardens section has been added to the website Art Lab & Gallery. In addition, two more illustrated comics from my series published in Landscape Architecture Magazine have been archived over in the Comics & Books section. 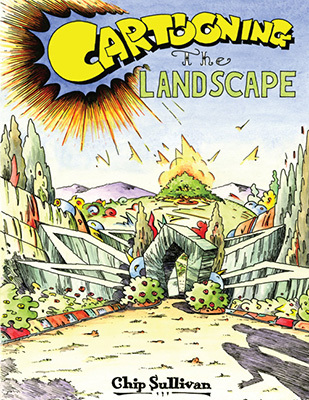 My latest book, "Cartooning the Landscape" is framed by a loose narrative in which a young man’s search for wisdom is fulfilled by a comics shop owner who instructs him not only in the essentials of illustrating but in how to see. The book takes us on a whirlwind series of journeys and is also a plea, in an era increasingly dominated by digitally rendered images, for a new appreciation of the art of hand drawing. You can find more information in the Comics & Books section.